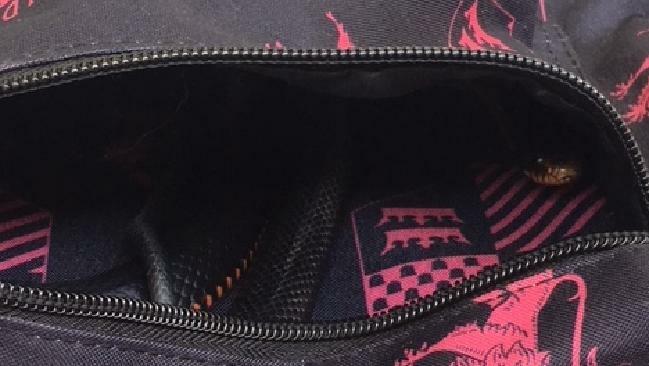 AN Ipswich girl got more than her morning tea today when she checked her school bag for snacks and instead found a red bellied black snake. Terrifyingly, the student at Augusta State School in Augustine Heights, southwest of Brisbane, only realised the venomous snake was there when it slithered over her hand. A staff member stepped in quickly to zip the snake inside and await its removal. When licenced snake catcher Lana Field arrived, she found the two-foot juvenile snake curled up inside. Ms Field said red bellied blacks were naturally shy, so it was likely looking for somewhere to hide when it slithered into the backpack. Ironically, the snake - the mascot for the Slytherin house from the Harry Potter series - had found refuge in a Gryffindor bag. Any fan of the series knows the two houses are mortal enemies. "It had every opportunity to bite the child because she's putting her hand in there in a dark space but it would have been more interested in hiding," Ms Fields said. "Nobody has ever died from a red bellied black bite." Ms Field, of Snake Catchers Brisbane, Ipswich, Logan & Gold Coast, said Ipswich call-outs for the species were common. "Particularly in areas where the are rock retaining walls and any areas where there is some water in the vicinity." It is believed the school emailed parents about the snake on school grounds as a precaution.